The rise of the internet has instilled a new dimension into project management. 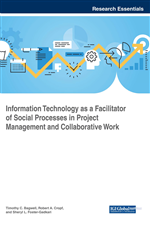 This chapter explores literature that evaluates virtual organization management and determines the extent new technologies contributed to task completion in dispersed locations. New channels of communication offer opportunities for participation, but there are still more challenges that project managers face in a virtual team setting than on-site teams. With global organization, talent spread across time zones and dispersed through various nations can be easily tapped by organizations. With advanced technology, companies are now effectively completing tasks and are growing new revenue in expanding markets in different parts of the world that were often merely islands with little interaction as they were limited to phone, fax, mail, or personal visits. However, the introduction of the virtual world of organizations demands that the leader and players be well trained and put forth the extra effort to overcome communication barriers. In today's high technology Internet-based world, many organizations and businesses are merely virtual organizations. There is no doubt that technology has effectively decreased the size of our world thus leading to collaborative networks of both domestic and international partnerships. This has led to the creation of new work environments that differ from the conventional business structures. These rapid advancements of technology has caused new organization structures referred to as virtual organizations. Project managers working in these new structures and multinational environments are often unprepared for the many cultural, regional, political and virtual issues that must be addressed in order to achieve project success (Wenjie, & Liehui, 2017). Project managers should seek better tools, resources and techniques to overcome limitations in projects. Communication inefficiency is evident in virtual organizations due reduced access and more so reliance on nonverbal communication cues. The difficulty is finding out what is needed to facilitate the transfer of knowledge among team members. One of the difficult tasks of a virtual project organization is in training project team members on how to best communicate and the recruitment of a critical and required number of team members. Participatory tools in a vital organization require continual learning and innovative thinking by the entire project organization focusing on the task/s undertaken. The phenomenon of the virtual project organizations is here to stay. Therefore, as a young science, project management must constantly reexamine its foundations on its understanding of how best to manage a successful project. To this end, project managers must ask the right questions and understand what communication tools are important, how to select, and more so, how to use the most appropriate technology in managing virtual projects. The nature of the Internet and the way it has made institutions communicate across great distances, has led to new forms of organizing for organizations. These new forms of organizing have attractive benefits for organizations to include but not limited to increased flexibility and cost savings. As a result, institutions in the recent past have taken advantage of these new technologies to distribute their workers and work and also shaped their information flows to fulfil their mission, business strategy, and objectives; thus they are now virtual organizations. A virtual organization brings together for a short time independent firms in partnerships thus enabling them to share expertise, cost savings and resources, until the objectives of the partnership are met and the network is dissolved. Virtual organizations exist largely in cyberspace and are unconstrained by the traditional barriers of place and time. The goal of the virtual organization is to provide high quality, innovative products or services in response to customer demands (Priego-Roche, Front, & Rieu, 2016). A virtual organization is defined as a flexible network of globally distributed entities that share skills, resources for a common goal. These entities form a cooperative venture involving companies, institutions or individuals to deliver products or service by Integrated Technology. A successful project manager must understand and manage obstacles of virtual teams located in various regions or countries (Gray, & Larson, 2000). These geographically dispersed members have completely changed the business interface. However, there are changing needs and concerns that arise from virtual organizations. These include available technologies and communication capabilities among others that project managers must quickly evaluate to ensure project success. Virtual organizations operate through electronic and phone communication. Thus virtual organizations have no shared office space where the company meets to conduct or transact any business. One example of a virtual organization is that of a freelance writing company which has authors contributing content from all over the world. These organizations may save money on overhead expenses, but they also have management challenges. These organizations are different from standard organizations in that virtual organizations do not offer the opportunity for workers to physically interact with co-workers. Managers also have to rely on the workers to monitor their own activity and maintain productivity.